This episode features songs that include the indigenous language of New Zealand - Te Reo Maori. In the 1950s and 60s Hawaiian music was a big influence on many NZ musicians, most notably some of the Maori show bands who were bringing together waiata and rock'n'roll. One of the first songs in this mode to hit the big time was 'Haka Boogie', written by Lee Westbrook and sung by Morgan Clarke with The Benny's Five in 1955. 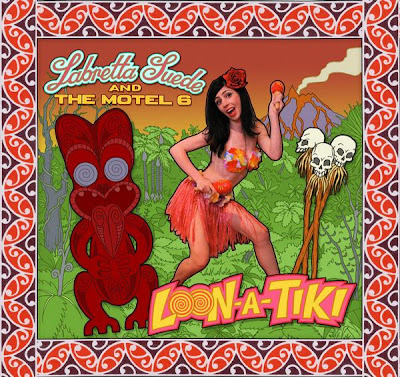 The song was recently covered by Labretta Suede and the Motel Six on an EP of covers of the band's favourite New Zealand songs, Loon-A-Tiki. There seems to have been an increase in recent times of the number of songs featuring the Maori language. Jess Chambers' Silver Scroll nominated song 'Island' is one of a bunch I've noticed that feature Te Reo. Chambers has a Kiwi father but an American mother and lived in California until 2002, so it's nice to hear her embrace her NZ roots. 'Island' comes from Jess Chambers and The Firefly Orchestra, an excellent album that has perhaps been overshadowed by her contribution to The Woolshed Sessions. The Ruby Suns are another kiwi band featuring a Californian, Ryan McPhun, who moved to New Zealand in 2004. The Ruby Suns song 'Tane Mahuta', arguably has taken Te Reo to more listeners around the world than any song other than the National Anthem sung before rugby tests. The song was a big hit in the music blogosphere last year, featuring on many many sites around the world. The version of the song I play in the podcast is recorded live, literally in the streets of Paris, and comes from The Blogotheque, a site featuring videos of bands playing in the French capital. They said of the Ruby Suns, "they came from a land of beaches and barbecues, sandy hair, and old, patch-colored pickups. They were bound to engulf Paris with sunlight". I highly recommend checking out the clips posted on the video page. Everyone in New Zealand knows Poi-e, the massive hit 1984 hit from The Patea Maori Club. This was a rare occurrence of a Maori language song topping the charts, sitting at number one for four weeks. The song was written by linguist Ngoi Pewhairangi with music by Dalvanius Prime who intended the song to be a way of instilling pride in young Maori. After initially not being able to secure a release Prime eventually formed his own label to get it out - and it went on to be a true kiwi classic. There are a number of remixes of the song about including a live version by 4-Corners and P-Money, a house mix by Soulforce and the one I feature in the podcast by The Beatworms, which you can download here. The original video is on the video page. To close I have another early amalgamation of Maori music and rock'n'roll. 'Poi Poi Twist was released by Rim D. Paul and The Quin-Tikis in 1964. Rimini Paul was a leading light in the Maori show band scene on the 1960s working with The Quin-tikis, The Hi-Quins, Howard Morrsion and Kiri Te Kanawa. Paul contributed the title track to the 1966 NZ movie Runaway. You can see him perform an excerpt of that on the films trailer which is available on the video page. It's got photos of Rim D. Paul.